Set in the early 20th century, this is the story of a slick, traveling salesman, Harold Hill (David Schiller), who cons residents of little River City, Iowa, into buying band instruments, lesson books and uniforms for their kids. Harold doesn’t know the first thing about the instruments or music, but he does know how to charm people by flattering them and bringing out positive qualities. Therefore, even though he fleeces them, he leaves a lot of good in his wake. Eulalie Mackecknie Shinn (Amy Meyers), wife of the blustery, domineering Mayor Shinn (Scott Solomon), asserts herself as leader of a women’s dance troupe in a hilarious scene. Then there’s Marian Paroo (Jennifer Mitchell), the town librarian. She’s slow to succumb to his charm, but eventually she does. Directed and choreographed by Nicole Helfer with musical direction by Sean Kana, this is a highly entertaining production with fine performances throughout its large cast of kids and adults. Mitchell as Marian is an outstanding singer, while Schiller as Harold embodies his charm and unflappability. In addition to the others already named, Jenny Matteucci as Mrs. Paroo, mother of Marian and Winthrop; and Andrew Plaschke as Tommy, the kid from the wrong side of the tracks, are noteworthy. Production values are high, especially the smart period costumes by Leandra Watson. The fluid set is by Mark Mendelson with lighting by Eric “Precious” Johnson and sound by Jon Hayward. In short, it’s great fun. 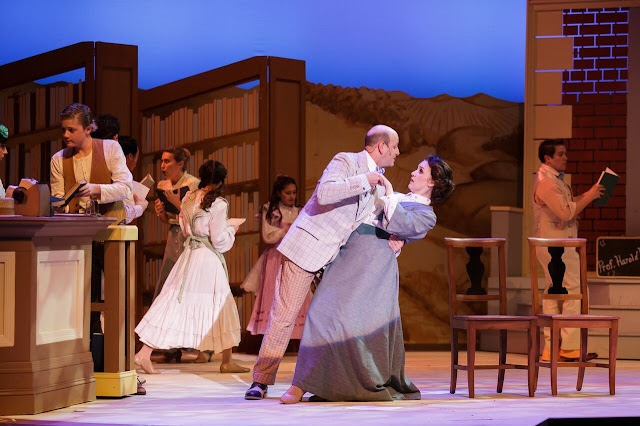 Running more than two and a half hours including one long intermission (long lines for restrooms and concessions), “The Music Man” will continue through April 1 at the Fox Theater, 2215 Broadway St., Redwood City. For tickets and information, call (650) 369-7770 or visit www.broadwaybythebay.org.